Dryomyzid fly - Dryomyza sp. 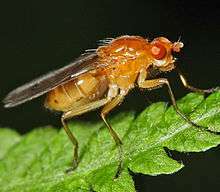 The Dryomyzidae are a small family of flies ranging from 4-18 mm long, with prominent bristles, and yellow to brown or rust-yellow coloring. The wings are very large. The subcosta is complete and well separated from vein 1. Larvae feed on decaying organic matter - carrion, dung, and fungi. The prelambrum protrudes from the oral cavity. Vibrissae are absent and the postvertical bristles are divergent. The roughly 22 species are placed in 6 genera (with two additional genera known only as fossils). Dryomyzid flies are found principally in the Holarctic, though some are found in the Southern Hemisphere. Very little is known of the habits of the adults or immatures, but adults are found in moist, shady habits among low-growing vegetation. Only four fossil species in three genera (all from the Tertiary) are known. 1 2 3 4 5 6 7 8 9 10 11 12 13 14 15 16 17 18 19 20 21 22 23 24 25 26 27 28 29 30 31 32 33 34 35 36 37 38 39 40 41 Mathis, Wayne N.; Sueyoshi, Masahiro (2011). "World Catalog and Conspectus on the Family Dryomyzidae (Diptera: Schizophora)" (PDF). Myia. 12: 207–233. Retrieved 1 March 2015. ↑ Shtakel'berg, A.A. Family Driomyzidae in Bei-Bienko, G. Ya, 1988 Keys to the insects of the European Part of the USSR Volume 5 (Diptera) Part 2 English edition. ↑ Burger, J.F. ; Anderson, J.R.; Knudsen, M.F. (1980). "The habits and life history of Oedoparena glauca (Diptera: Dryomyzidae), a predator of barnacles" (PDF). Proe. entomol. Soc. Wash. (Print). 82: 360–377. ↑ Suwa, Masaaki (1981). "Description of a new Japanese species of Oedoparena, an Asio-American dipterous genus (Dryomyzidae)" (pdf). Insecta Matsumurana. New Series. Hokkaido, Japan: Hokkaido University. 20: 29–35. ↑ Mathis, W.N. ; Steyskal, G.C. (1980). "A revision of the genus Oedoparena Curran (Diptera: Dryomyzidae; Dryomyzinae).". Proe. entomol. Soc. Wash. (Print). Washington, U.S. 82: 349–359. Wikimedia Commons has media related to Dryomyzidae. Steyskal GC (1957) A revision of the family Dryomyzidae (Diptera,. Acalyptratae). Pap. Mich. Acad. Sci. 42:55–68. World revision. Species keys. Czerny, L. (1930), Dryomyzidae und Neottiophilidae. 38b. In: Lindner, E. (Ed.). Die Fliegen der Palaearktischen Region 5(1): 1–18. Keys to Palaearctic species (in German).